A donation from a local business will help the Judeo-Christian Outreach Center embark on a major renovation project. 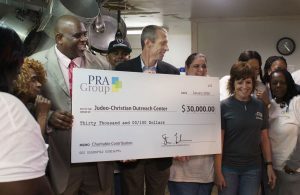 PRA Group, a debt-buying and collections company, donated $30,000 during a community lunch Thursday. The center offers emergency housing, low-cost housing and supportive services, including substance-abuse counseling and job placement. Staff and volunteers serve a meal daily to the center?s residents and others in need. The first phase of the renovation project includes construction of an 8-foot brick wall with a gate to surround JCOC?s property at 1053 Virginia Beach Blvd. A men?s dorm building, which is currently condemned, will be demolished and rebuilt. The new, three-story building be around 6,300 square feet. ?Everyone at JCOC works hard to help make life better for families and individuals who are experiencing homelessness,? said Kevin Stevenson, president of PRA Group, in a news release. ?We are honored to partner with JCOC on this building project, which will have a major impact on breaking the cycle of homelessness in our community. ?